Some time ago, I had a curious day, because in the same day I’ve seen several people giving a misstep in the street, with similar reactions. Of course, I’ve had missteps, several times. When it happens in public, it’s not so important to break an arm or a leg. The important thing is that no one sees it. 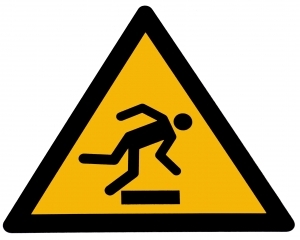 Of course, misstep, falling, mistake, is an analogy to any kind of failure. And, we feel TERROR to failure, to any kind of it. If we don’t want a misstep, I have a magic solution: safest is avoid walking. Simple. 100% guaranteed. But, fear should not paralyze us. Failure improves us! And to provide contrast, I’d like to share something that I’ve red from the book “Create or die” from Andrés Oppenheimer. It works as an important lesson (theoretical, because besides reading hundreds of times, fear doesn’t leave). The author was surprised about the culture that you can “breathe” in Silicon Valley: example, extraordinary people that had 4 enterprises. Current is fine, but it mens that he failed on the previous 3. Instead of being ashamed, and hiding failures, he was proud of them, as if “each failure was a university degree”. And talking about universities, it’s hard to see a graduation commencement speech that doesn’t mention failure. Whoever gives the speech, who may probably be someone succesful, gives the following message: I’ve also failed, but now I’m here :). Give yourself a chance!